Long before her recent plastic surgery admission, Jane Fonda was front and center of numerous cosmetic surgery rumors throughout the years, now at age 73, she is coming clean about the procedures she has undergone. On her own personal blog she wrote a few words about her recent work, and the new shorter haircut she used to offset any keen eyes. I just had some 'work' done on my chin and neck and had the bags taken away from under my eyes. I decided to get a new haircut so people will think it's my new hair. I didn't think that I would want to have anything done but it actually got to the point where I would startle myself when I saw my reflection in the mirror. I felt so great after a good night's sleep, and suddenly I'd look at a reflection of myself and didn't look like I felt. 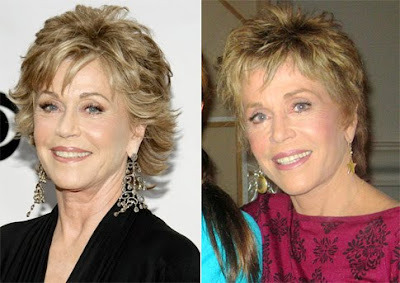 What do you think about Jane Fonda's post plastic surgery results? Thumbs up, or thumbs down? like it very well done looks like a touch-up than a make over. An excellent example of 'work' done tastefully. The others should ask who her doctor is. her husband is a plastic surgeon, from what i heard! well done Jane! Some of the best work I have ever seen. So natural but with amazing results. Ms Fonda looks like she did in "Coming Home". Now how many years ago was that! Who is HER plastic surgeon. Everyone in Hollywood should be lining up. Beautiful! IMO, she's the first celebrity that looks as good or better following plastic surgery. She actually looks good in both pics. absolutely fabulous in a modest way.